Welcome to The Noble Artisan’s Online Shop. 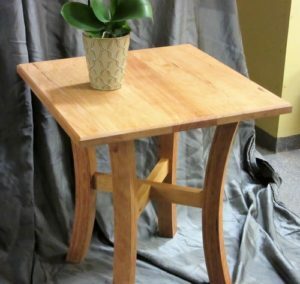 We will be showcasing handcrafted woodwork pieces on this page that are available for purchase. If you are interested in purchasing one of our heirloom quality pieces, simply send us an email at info@thenobleartisan.com OR send us a message on our “Contact Us” form. We would be happy to assist you with any questions you may have. 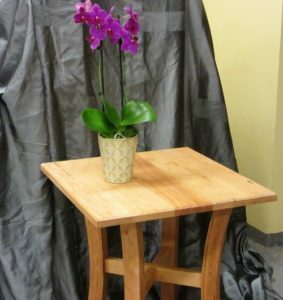 The first piece we have available is this beautiful cherry wood modern end table. It is made with a curved leg aesthetic from bent lamination and a top of thick air dried cherry. Makes for a beautiful piece for the home or office.